Membership Certificate: You will be sent an official, wall-mountable membership certificate. Newsletters: Newsletters will be sent to you informing you of the latest develpments, products and educational seminars and special events available to you through out Estonia and the world. Government lobbying for represntation and inclusion in the Estonian Health Care System. Patient referrals from our head office from patients looking for care. As a member, your name and contact information will appear in our directory. FREE or deeply discounted subscriptions to the various professional health journals.. Enjoy the prestige of being a member of EMMCA’s specialty councils. 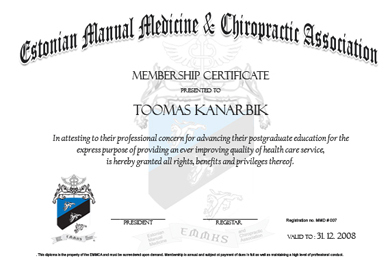 These are just some of the stepping-stones used by members of the Estonian Manual Medicine and Chiropractic Association on their way to a healthier more successful practice. Don’t be left behind! Join EMMCA now and put us to work for you and your patients.